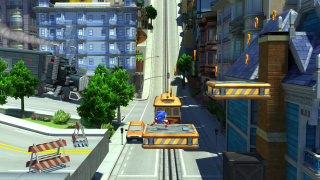 City Escape is the fifth level in Sonic Generations for the PC, PS3, and Xbox 360, and an adaptation of the original City Escape seen in Sonic Adventure 2. Rollin' around at the speed of sound on the sloping streets of this bustling city, modern Sonic is faced with a wide open Act with much more freedom to walk around. While both characters will have an encounter with the dreaded G.U.N. Truck, classic Sonic is pursued by it for the majority of the stage, and lots of the platforming relies on keeping ahead of the pantechnican's destructive rampage. City Escape is part of the Dreamcast-era trio of levels opened up after the defeat of the Death Egg Robot, coming after Speed Highway and before Seaside Hill. Rouge the Bat is the character to be unfrozen outside this level; if it's modern Sonic who does the saving, Rouge remarks that this is the first time she's been stolen. This isn't actually true: Eggman Nega stole her once before, during Shadow's story in Sonic Rivals. The level includes cameos of several Sonic characters long since vanished from the games. Nack the Weasel, Bean the Dynamite, and Bark the Polar Bear all appear on WANTED posters strewn around the place, while Mighty the Armadillo and Ray the Flying Squirrel are pictured on a missing persons' flyer. Classic Sonic speeds through the level like normal, until partway into the level, the GUN truck smashes out from behind a building and endlessly chases down Sonic for the rest of the level. Along the way, the destruction that the GUN truck brings can open new paths, and destroy access to other paths. The GUN truck is defeated at the very end when it smashes into a concrete highway pillar and is sent careening off to the side. The modern act has a ton of similarities to the original stage from Sonic Adventure 2, to the point where it can almost be considered a recreation of the original layout, only redesigned around Modern Sonic's moveset. 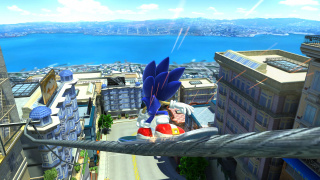 The act starts off with Sonic snowboarding down the streets of the city, and ends with a chase scene from the GUN truck. This time, however, the GUN truck is more relentless and determined to take down the player, to the point where it will fly and chase Sonic on a wall. Sonic only loses the truck when he manages to slip through a crack between two buildings, and enters the Goal Ring area, which resembles the original. Mono Beetle - A threatless hovering robot, good only as homing attack fodder. Gun Hunter - Humanoid robots that fire energy balls.